With the lucrative holiday shopping season in full swing, the popular iPhone 5 handset is now readily available in the U.S. at Apple's brick-and-mortar retail stores as the company has apparently overcome supply issues experienced since the device was launched in September. While the Apple online store still shows one-week ship-by dates, Piper Jaffray analyst Gene Munster said a poll of 20 U.S. Apple Stores reveals the iPhone 5 is readily available at physical Apple Stores for the first time since the unit was released at the end of September. The analyst performs a nightly check with the online Apple Store for local pick-up orders half an hour after new stock arrives at 100 locations. He also noted that 20 out of 20 Apple Stores polled showed availability for Verizon models, the supply of which has been the most constrained out of the three major U.S. carriers. "The bottom line is that AT&T, Sprint and Verizon are consistently showing 90%+ availability," Munster wrote. AppleInsider was able to verify the claims with local Apple Stores, most of which had all versions of the iPhone 5 available for purchase as of Wednesday night. 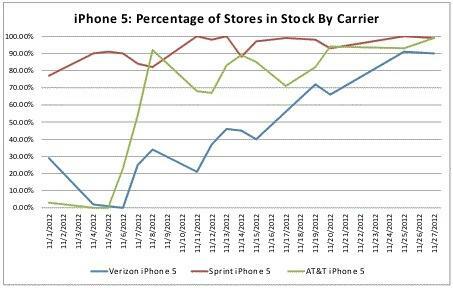 A similar report earlier this month showed that, while inventory of Sprint versions of the Phone 5 was improving, models supported by AT&T and Verizon's networks were still seeing constraints. Going further, Munster maintains his estimate of 45 million iPhone shipments for the fourth quarter, but warns that there may not be a significant upside as supply is only now meeting demand. 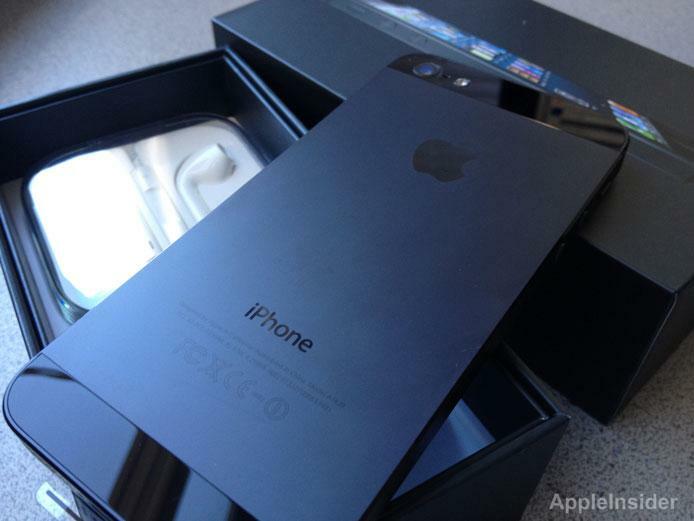 According to a recent report, the iPhone 5 helped to double Apple's share of the U.S. smartphone market, pushing it ahead of worldwide leader Android.